« Astarotte no Omocha! episode 8: Who let the dog out? who? who? After the last D-mail the IBN 5100 disappeared and now Okabe needs to look at what point the past changed and where could the computer currently be. The story is getting quite interesting as of late isn’t it? There is so much going on. Most story focus solely on developing a plot or developing characters. But in this episode we were able to see more of multiples characters and see the story go forward. The story is going deeper into each characters, lets take a quick look at what we learned about each of them. We learned that Kurisu’s life might not be going as well as we believed. She seems to be in some conflict with someone and it saddens her. 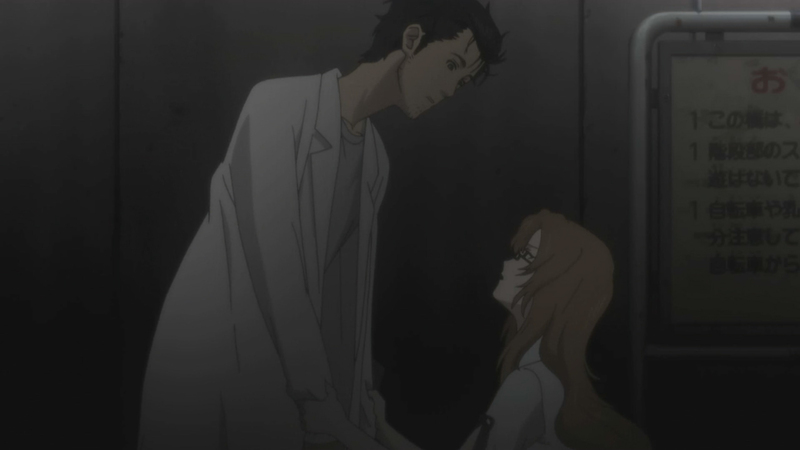 The relationship between Kurisu and Okabe seems to be heading towards love. Another truly interesting fact is that Kurisu is now revealed to be a 2channer. It is always interesting to see meme appear on television. 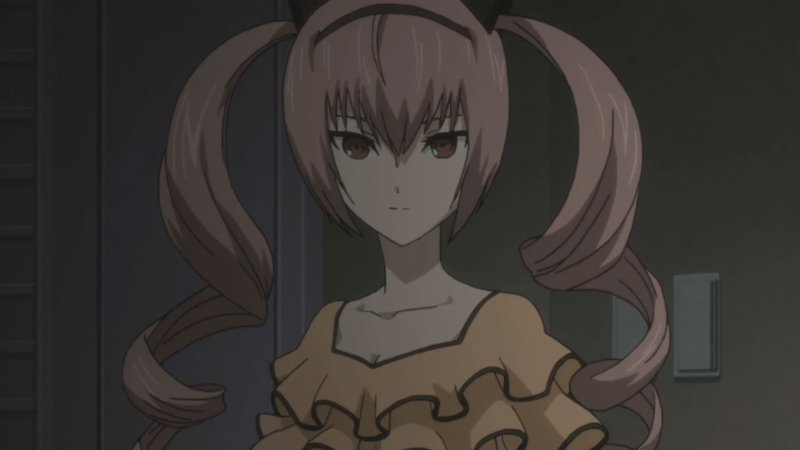 In term of character development we also learned that Mayuri sees Okabe changing, little by little. I guess what we can really observe right now is how he starts to question himself even more. becoming self-conscious of his action is not a quality observed in usual mad scientist.Okabe is starting to feel the consequence of his action, suddenly, this is not a game anymore. He always fantasize and dreamed about power, but when you finally hold that power in your hand, you find that it might be more consequential than what you believed. Moeka was seen once again, and she was in complete dissapear, I do believe this girl can remember the past, or something similar, after each change. I think we can expect Okabe to become as confused and desperate as Moeka in only a little while. Both of them have memories that are now false and a present they don’t understand. They are lost souls travelling to a strange land that looks still so familiar. The last character we got to learn a lot about this episode is Feyris. That young lolly, always so sure of herself, is in fact the owner of most of the city. She acts like a cute girl in a cafe in the day and controls the city at night, or so I want to believe. She is the one responsable to bringing the moe culture into the city. She had something she wanted to change in the past, and suddenly when that is done, she is happier than ever, she now have a loving father at her side and the whole city has changed. I don’t know if Feyris’s father died and her message was to prevent his death, but changing the past is dangerous, especially if you do it to someone who pulls so many strings like Feyris. 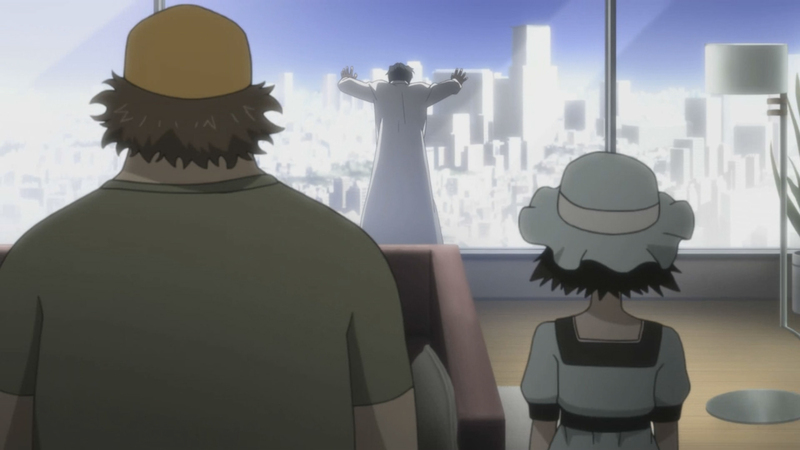 Now Okabe is in a city he doesn’t even know anymore. 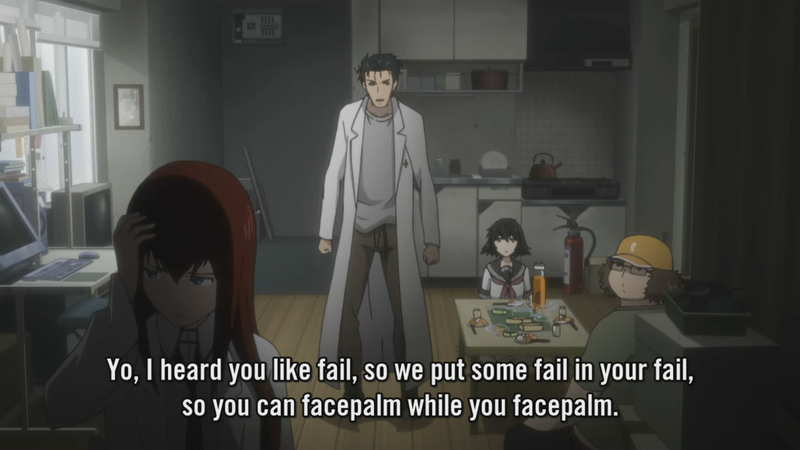 Also Okabe needs to realize that he can’t exchange favor for a D-mail, since after the trade no one will remember the trade even happened anyway ! Now Feyris can’t tell you where the IBN 5100 is, she doesn’t even know you are looking for it. I have a feeling the more the show will progress, the more we will be like Okabe, lost voyagers in a confusing location. Everything we just learned about the character, they don’t mean anything, since it is possible that all of that background is now changed. This is why I love this show, you are at a complete loss of control. It is only 9 episode in the show and things are already starting to feel out of control. If things are not slowing down soon, brain will melt. I love the smell of melting brain, so I sure hope things get even more confusing. I have a feeling some great dramatic event will occur in the future, I am looking forward to discovering what they will be. Tagged anime, d-mail, feyris, hououin, kurisu, okabe, review, Steins; gate, time. Bookmark the permalink.